Crossing the stage at graduation is the highlight of any Campbell student’s college career. Not only are their accomplishments celebrated, but they are granted a diploma acknowledging they completed their education at Campbell, a diploma they can proudly take with them into their future career as a symbol of what they have learned. 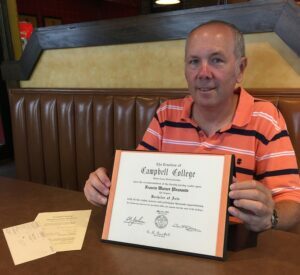 When Jonathan Paris, a Whispering Pines resident, found a Campbell diploma from 1964, a surprise at the bottom of a box of knick knacks and old dishes at a rummage sale, he knew he had to return it to its rightful owner. For five years, he held onto the framed diploma, trying to track down Frank Pleasants, whose name was on the paper, wanting to know who he was and if he was still living. . “I reached out to someone with the same name as Frank, but there was no relation,” Paris said, before deciding to contact Campbell’s Office of Alumni Engagement to see if they could put him in touch with Pleasants. As it turns out, Pleasants was still living, although not in the United States. The Campbell graduate is a resident of France now, making it even more difficult for Paris to track him down. The Office of Alumni Engagement shipped Pleasants his diploma, which he had never even received due to his military service. 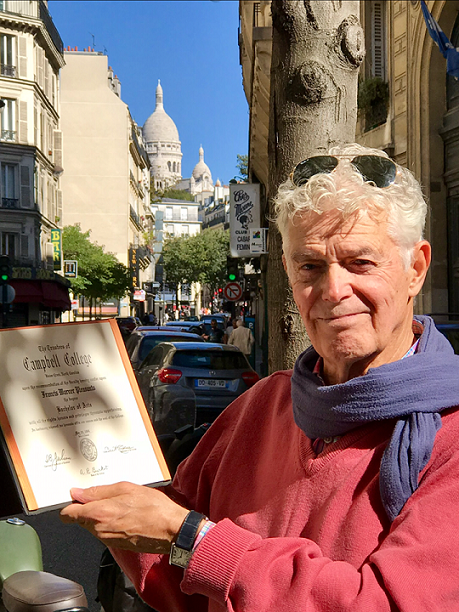 He received the document in September 2018, 54 years after his graduation. The Office of Alumni Engagement keeps meticulous records of alumni contact information and their records. Pleasants was not in the database due to having lost contact with the University after graduation, so Nikki Olive, Director of Alumni Engagement, went the extra mile to track him down using social media. “We found someone who we thought may be the correct Frank Pleasants, sent a message explaining what we found. Fortunately for us, it was him. Through a string of social media messages, we confirmed that it was his diploma and that he was interested in receiving it, as well as hearing the story of the diploma’s journey,” Olive said. From there, it was a simple matter of meeting up with Paris to collect the diploma and mailing it to Pleasants’ residence in France. Pleasants and Paris now have one another’s contact information, and Pleasants is now a newly connected member of the Campbell University alumni family. By Paris’ actions in reaching out to the Office of Alumni Engagement, Pleasants was united with his diploma and formed a new relationship with his alma mater. The Office of Alumni Engagement is excited to bring people together, whether through finding past college roommates, tracking down classmates, or connecting graduates with long lost documents. They are proud to be a part of both new and preexisting relationships between Campbell alumni and friends of the university. Learn more about the Office of Alumni Engagement at alumni.campbell.edu.